It’s something of a surprise that I find myself here at Trinity. I initially completed my BTh at Morling College in Sydney, convinced that God would never need me to leave Sydney. But while studying there, I was convicted of the need to see the global work of the gospel, and my wife Lynne and I spent seven years in Africa working with the Australian Baptist Missionary Society, training local believers to take on the work there. Prior to that we had spent a year in the UK while I completed an MA (with a dissertation looking at poverty and wealth in Amos) at London Bible College. I also completed my PhD (on responses to violence in the Psalms) through the University of Pretoria while we were working in Zimbabwe and South Africa. 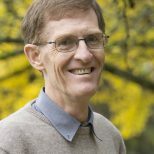 Through a long process, God led us to pastoral work in Sydney again and then a move to the UK, where I have taught Old Testament at Cliff College and then St John’s Nottingham before coming to Trinity. Throughout, I have sought to integrate my study of the Old Testament with what it means to be a part of God’s mission today. Lynne and I have been married since 1987 and have three adult children, all of whom now live and work in or near London. If I could sum up my research interests, it would be that I am interested in how poetics and ethics interface within the Old Testament and how this shapes mission. I’m particularly interested in this in the books of Joshua, Judges, Samuel, Kings, Esther and Psalms. You can email me at d.firth@trinitycollegebristol.ac.uk. 1 & 2 Samuel: A Kingdom Comes (London: Bloomsbury T & T Clark, 2017). Exploring Old Testament Wisdom: Literature and Themes, co-edited with Lindsay Wilson (London: Apollos, 2016). The Message of Joshua: People and Promise (Nottingham: IVP, 2015). 1 & 2 Samuel: A Kingdom Comes (Sheffield: Sheffield Phoenix, 2013). Interpreting Deuteronomy: Issues and Approaches, co-edited with Philip S. Johnston (Nottingham: Apollos, 2012). Presence, Power and Promise: The Role of the Spirit of God in the Old Testament, co-edited with Paul D. Wegner (Nottingham: Apollos, 2011). God Present but Unseen: The Message of Esther, the Bible Speaks Today series (Nottingham: IVP, 2010). Interpreting Isaiah: Issues and Approaches, co-edited with H. G. M. Williamson (Nottingham: Apollos 2009). 1 and 2 Samuel, Apollos Old Testament Commentary (Nottingham: Apollos, 2009). Words and the Word: Explorations in Biblical Interpretation and Literary Theory, co-edited with Jamie A. Grant (Nottingham: Apollos, 2008). Surrendering Retribution in the Psalms: Approaches to Violence in the Individual Complaints (Milton Keynes: Paternoster, 2005). Interpreting the Psalms: Issues and Approaches, co-edited with Philip S. Johnston (Leicester: Apollos, 2005). Hear, O Lord: A Spirituality of the Psalms (Calver: Cliff College Publishing, 2005).